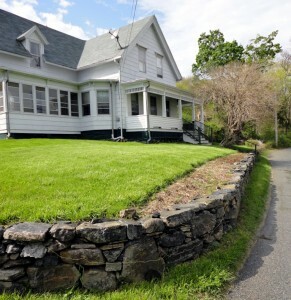 The boys are visiting their grandmother this weekend… which gives me lots of time to work on the house. 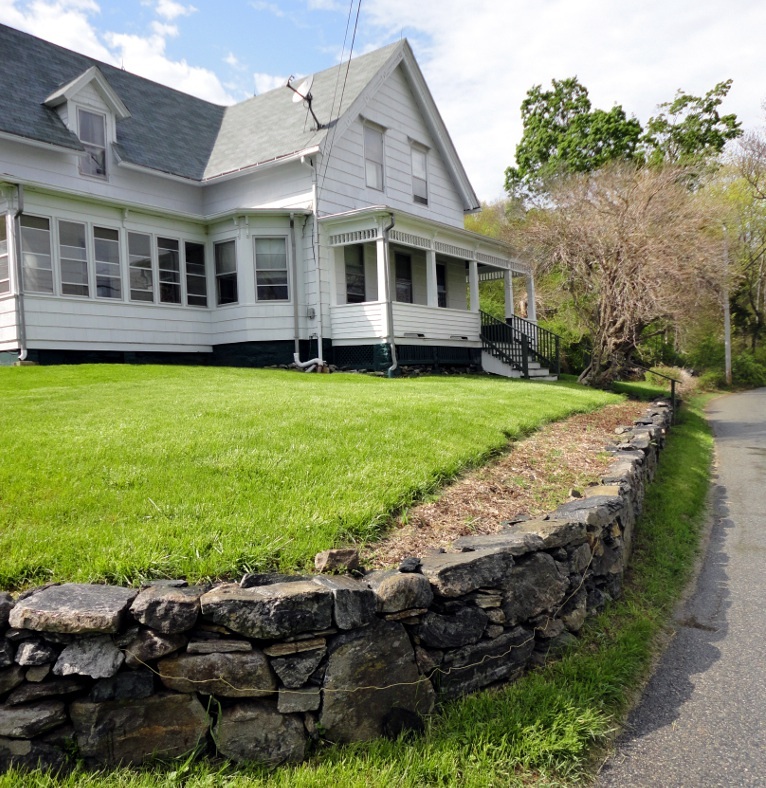 I was able to mow the grass as well as work on Ben’s room. 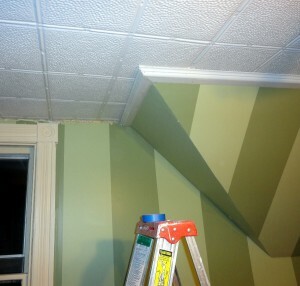 Last weekend I put together the crown molding pieces for the edge of the ceiling where it meets the sloped wall. 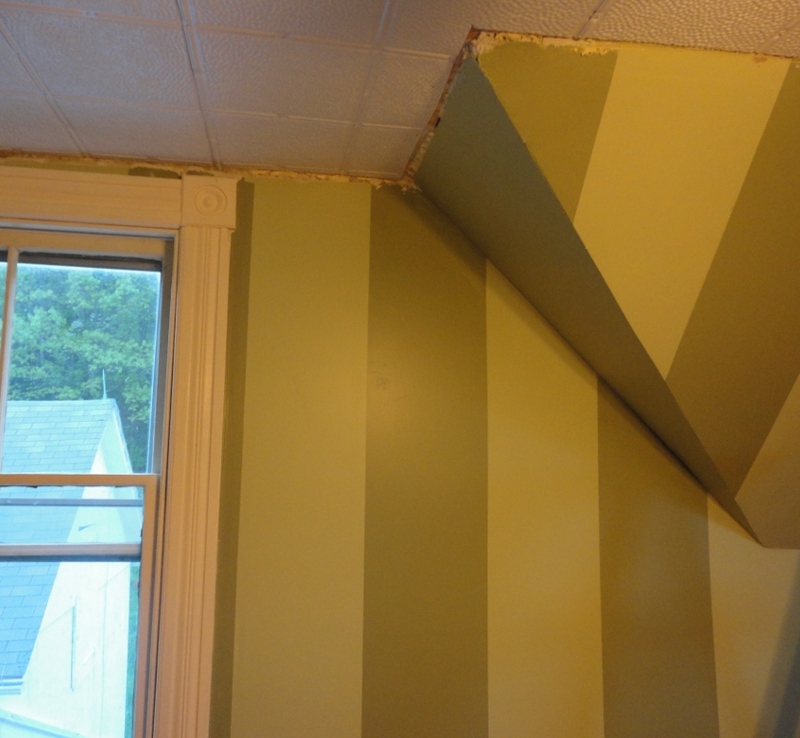 Crown molding is designed for a 90 degree angle (normal vertical wall), but the room has two sections of the wall where it isn’t vertical. It wouldn’t be a problem if I had put drywall on the ceiling. However, I did a tin ceiling (well, aluminum) and that requires crown molding to cover the edge of the metal ceiling. 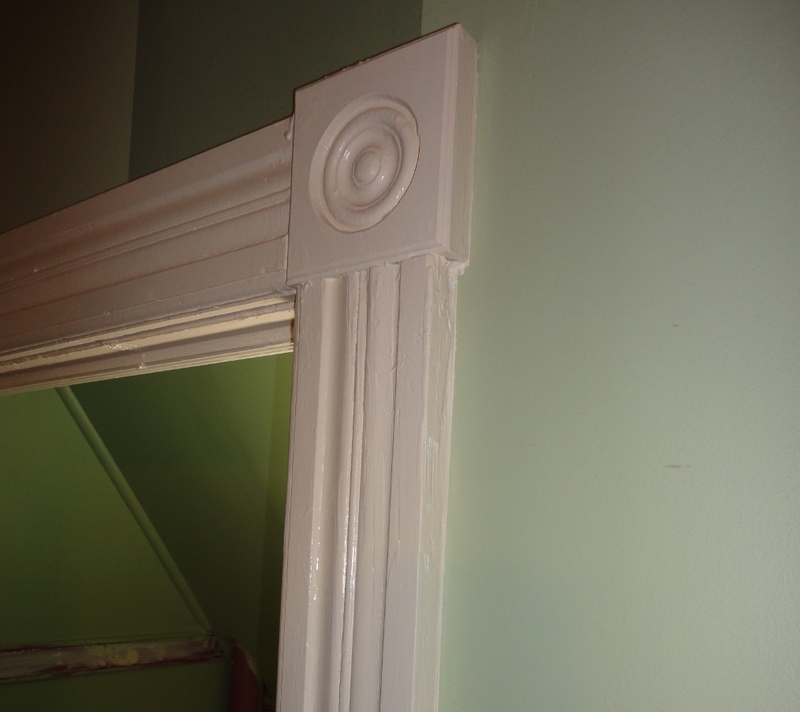 This morning I was able to prime and paint the crown molding, and this evening I was able to install the two pieces on the sloped wall. The rest I will cope and install tomorrow. Excuse the color of the first image, the inside lights make the image a bit yellowish. 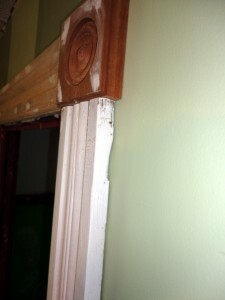 To make the crown molding fit, I cut a piece of wood to fit in the gap between the molding and the sloped wall. 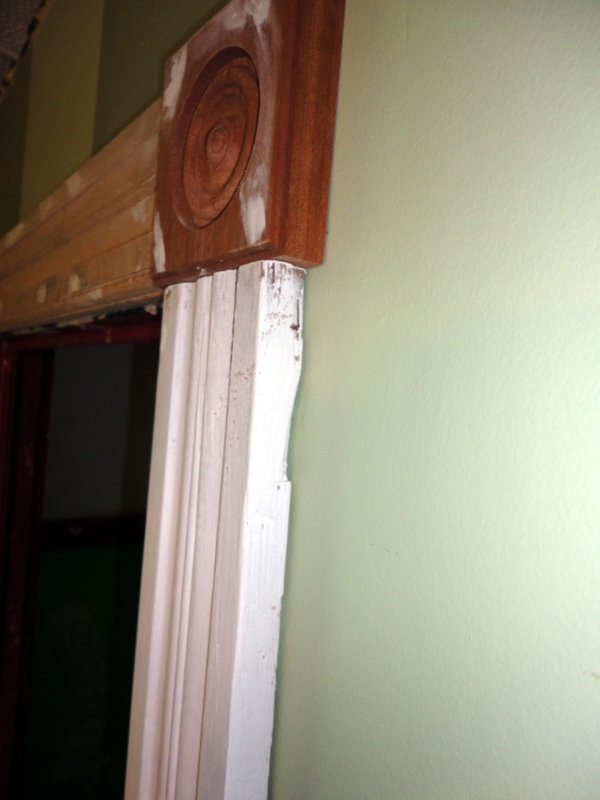 I glued the wood piece to the molding and then attached it as a single piece of trim. Ceiling after crown molding pieces installed. I also painted the trim around the door to the closet. I don’t have any baseboard trim up yet, so painting one door at a time make sense. I’ll just have to touch up where I install the baseboard trim. The process was pretty easy. I taped around the trim. I then ran a bead of caulk around the edge of the trim (to make up for unevenness in the wall), smoothing the caulk with my finger. I then removed the tape before the caulk cured. After the caulk cured for two hours, I re-taped around the trim and primed and painted the trim. 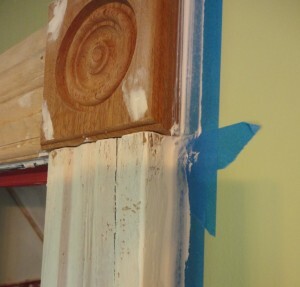 The result is a very clean joint between the trim and the wall. 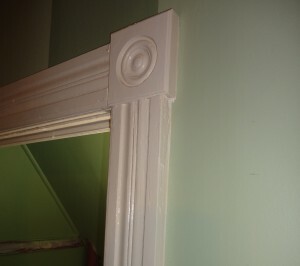 The first picture is of the trim as installed. The trim pieces are original. Some of the pieces were damaged when they were pulled off the wall when I started renovating the room. I made the rosettes (a bunch of the originals broke when I removed them). In my last house, I made the mistake of hammering the nails from the back of the trim, then pulling them out from the from. That caused the large holes where the finish nails pushed chips of wood out. For this project I pulled the nails out from the back. 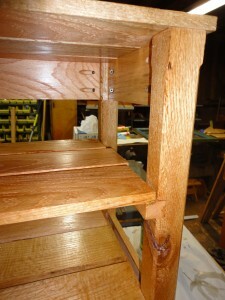 Trim is installed with finish nails, and they are simple to pull out from the back. That leaves the front of the trim looking clean. I purchased a special pair of pliers for this purpose (crazy that they make a tool for specifically pulling the nails through the trim from the back). I purchased a drill bit to make the rosettes. I had searched at Home Depot and found trim rosettes, but they were just a little too small for the trim I had. So I had to make them. I milled some scrap sapele to 1″ thickness and then cut squares out the appropriate size. I set up a fence on the drill press and drilled out enough rosettes for the room (and a spare or two). Of course it is a shame to prime and paint a nice wood like sapele… but it was scrap so it is cheaper than getting pine at the box store. When I was waiting for painting projects to dry, I started my next workshop project. I milled most of the white oak needed for a sitting bench that will go out by the fire pit (what is there now looks terrible). The big question is do I make it a quick project (and use pocket hole screws to put together), or do I take the time and make it with mortise and tenon joints. 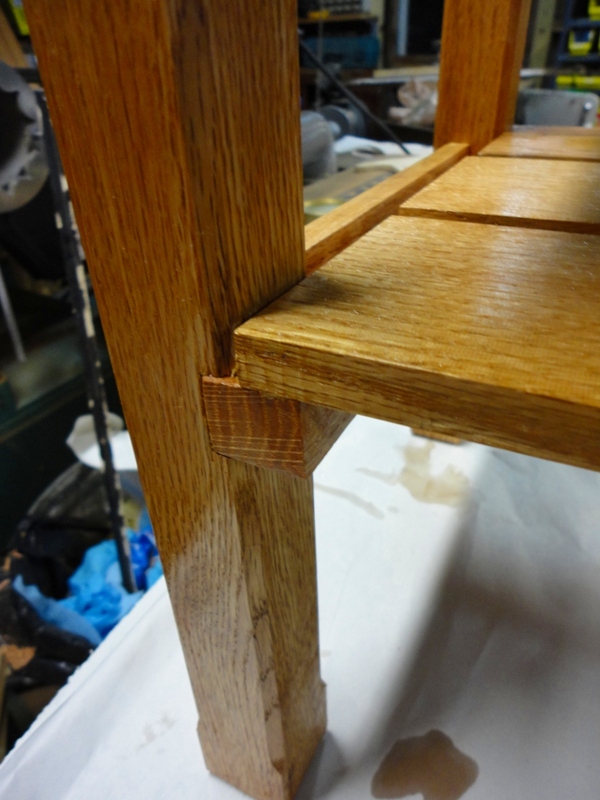 I’m actually leaning towards mortise and tenon joints – I’ve been avoiding traditional joinery for the past few projects. The boys had been talking about this trip all week. 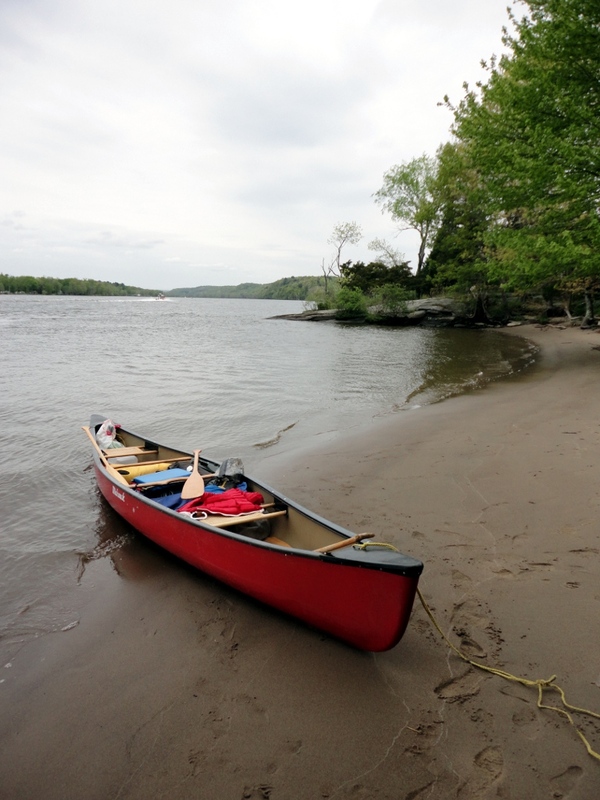 I had done some research on where to do river camping here in Connecticut and found that the state has several campgrounds that are accessible only by canoe or kayak. Several weeks ago I checked the DEP website, got the address needed, and then wrote to them requesting a camping permit (of course enclosing the needed $15 to cover the permit). A week later I had a permit waiting in the mail for Ceders Camp Area in Selden Neck State Park. I called my dad and asked if he wanted to go camping with the boys this weekend. He was actually in DC this past week, so the trip up wasn’t too far out of his way. 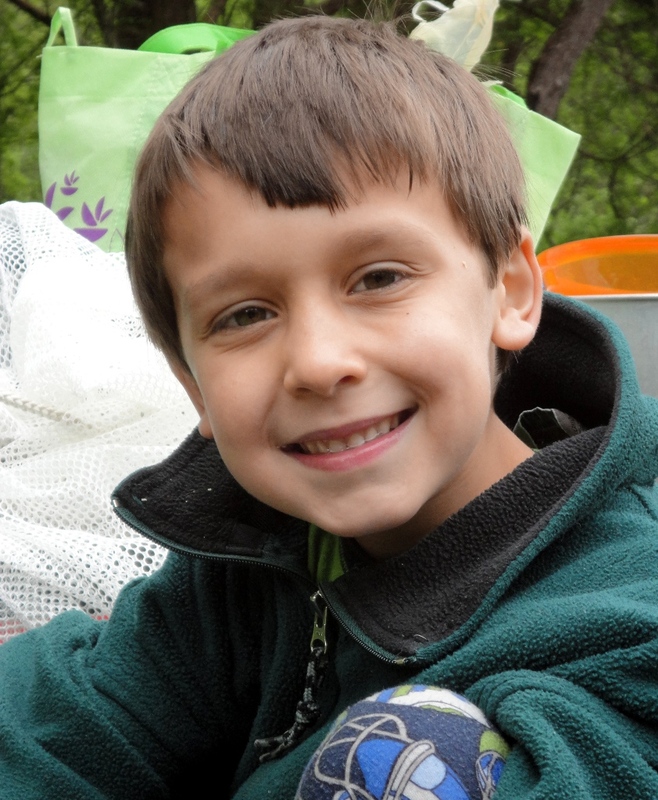 I picked him up on Friday afternoon, and we quickly packed up the car before the boys came home from school. We tied the canoe to the roof and drove to the Hadlyme Ferry. Of course I wasn’t sure how often the ferry ran, so we drove all the way around. Next time I’ll just take the Ferry across. $3 for the car and it runs about every 15 minutes (we took it home). We unloaded in the parking lot next to the ferry and loaded up the canoe. It was nearly 5pm by the time we were on the river. We paddled down the river for maybe 20 or 30 minutes and arrived at our campsite (I had to pick a site near the put-in – the boys don’t get out of school until 3pm and with a 9am transition to their mother’s house on Sunday morning, a Saturday night camping trip was out of the question). We had a great night camping. Both Will and Ben took some time when we got there to go swimming in the cold water, then set up their tents (with help). We found firewood (we had to hike a bit to get it), made a fire, and cooked dinner. Ben was pretty tired; he had stayed up until almost 10pm the night before. 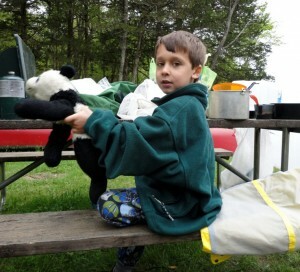 After dinner, as we were getting the s’mores ready, Ben decided to go lay down in his tent. I asked him, “are you going to bed?” He replied, “No, I’m just taking a nap.” I explained that if you take a nap at night and wake up the next morning, then it counts as going to bed. But either way, I let him take his nap. He slept until the morning. Will followed not too long after that. 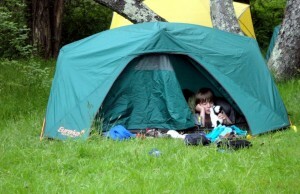 The boys had insisted in each sleeping in their own tents. I didn’t really want to buy enough tents for them to each sleep in their own tent, but I pulled out an old tent I had for my dad and I to share, and let the boys sleep in their own tents. I was sure they would get afraid at night and not want to sleep alone. I was wrong. Not a sound was heard from either of them until the next morning. I was up early – it get’s light around 5am this time of year, and dad snores. I got the fire going again and walked around a bit. Will was the next one up, followed by my dad and Ben. That morning both boys wanted to try the rope swing into the river. I told them the water was cold, but they could use the rope swing. They got in their swim trunks, put life jackets on and headed over the the rope swing. Will got Ben to agree to try the swing if he did it first. In Will went. Into the very cold water. Next it was Ben’s turn. In he went. The look on his face was perfect. He was very surprised by the cold water. I’m pretty sure if he could have found a way to walk on top of the water he would have. The boys then decided to change into their dry pajamas (which they wore the rest of the trip). We finished breakfast. I stayed in camp while my dad took the boys exploring our part of the island. 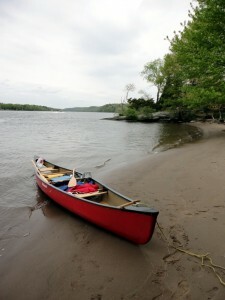 When everyone was back (and the kids getting a little bored), we broke camp and decided to canoe around the island. I had talked to a pair of rowers that were passing by earlier – they told me it was a nice 3.5km loop around the island. It wound up being a pretty long canoe trip around the island. Not too long, but getting close to too long. We stopped to check out the other campsites on the island (the boys chose Hogback Camp Area for the next trip – scheduled for early June). 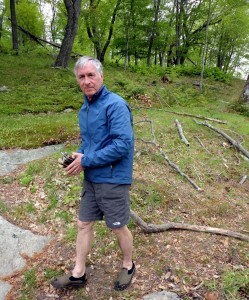 The wind was a bit strong when we rounded the island and left Selden Creek and entered the Connecticut River. The wind and wakes from the passing boats on the Connecticut River made the passage back up the river a bit slow going. But the boys were as patient as could be expected. Overall it was a great first camping trip for the boys. They are excited to go again. It was a great starter trip for the year to highlight missing gear, planning etc. We made the trip in a 17′ Mohawk canoe, brought 3 tents (2 small Eureka backpacking tents for the boys, and one large cheap 4 person dome tent for my dad and I – I”m not sure how well that would have fared if it rained). I could definitely use another dry bag before the next trip and a couple more duffel bags to store gear (it is easier if all the gear is in bags to stow in the canoe). I also need more camp chairs (we only had one, but there were picnic tables at the site). We packed in all of our water, and went through nearly 2 1/2 gallons of clean water that night – if it were for a longer trip I would have to get a new water filter. I also forgot how much colder it can be on the river, and next time should pack another layer or two for the boys. I also need a coffee press – no coffee is no fun. I brought backpacking pads to sleep on. But I’m getting old, and weight isn’t as much of a problem on a canoe, so I think I’ll get a more comfortable sleeping pad for the next trip. 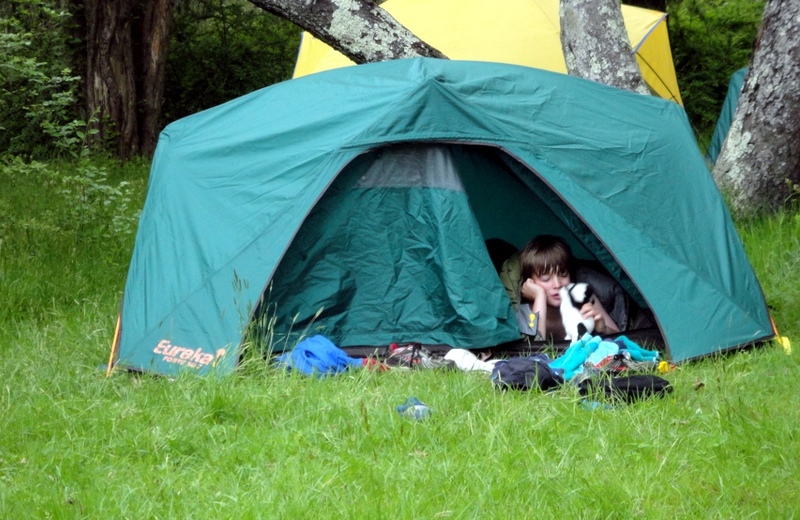 Maybe trade some weight off with tents and pick up a smaller/lighter third tent. The propane stove is also on it’s last leg. I have a gas backpacking stove, but I do like the convenience of the big double burner propane stove when weight isn’t as big of an issue. Sometime last winter I had decided that it was time to replace the ugly cheap shoe cubes that sit in the mud room. I figured that I could build a quick set of shoe racks that would last until I decided to eventually renovate the mud room. Of course I started the project, and then other things came up and I didn’t finish (yes, I’m good at starting projects, a little less good at finishing them). So the project sat in the basement until this week. Partially completed. I had milled the lumber out of scrap red oak. Of course the shop isn’t heated in the winter, so I did rush and didn’t really spend much time picking out the wood for the project. The pile of red oak I have isn’t the nicest wood. It was a pretty hasty construction. The rails and stretchers are attached to the legs using pocket hole screws. The slats are just glued to the supports. All the stretchers, rails and slats were milled to 1/2″ thickness, and some small details were routed into the legs. So what do I not like about the shoe rack? Several things. I would debate remaking the whole project if it weren’t temporary, but it is better than what I have, and I have lots of other projects to work on. From a design standpoint, I don’t like the supports for the slats. The stretchers are attached in the middle of the leg, so to get a gluing surface I milled a 3/4″ square piece of oak and cut a dado into the legs to support the support. Then the slats were glued to the surface. No end grain gluing, so it is pretty strong…. We’ll see if it fails over the next couple of years. I think I would make the shelves similar to a door, using rails and stile construction, and then just sliding the shelves into the dados. The other design change would be to make the shelf slats out of thicker material. The 1/2″ oak is feels a little too flimsy across the span. Maybe mill it to 5/8″ vice 1/2″. I think also changing from pocket hole screws to mortise and tenon joints would look much nicer. Maybe I’m still afraid a little to try my own mortise and tenon joints. From a construction standpoint? I made several mistakes. First, I should have spent more time looking through the lumber stack to find better wood . Look at the picture on the left and see the big knot in the leg. I also cut one of the slats the wrong length… I felt too lazy to mill another part and get it to the right length. Of course it was cut too short. I could have shortened the rest of the slats, but didn’t think that would look good. I should have constructed the frame, and then attached the lower shelves first. That would have ensured that the frame was square (there is no front stretcher to ensure that). It turns out that the front is maybe 1/16″ wider than the back. I didn’t spend much time finishing the project. It is only going to have shoes put on it… and will eventually be replaced with something more permanent when I redo that room. I should have given myself one more night to sand the slats before gluing them on. My planer still makes little ridges on the surface (I think one blade is the wrong height – I really should check it before the next project). The oak isn’t the straightest grain, so I did get tear out. Maybe this is an area where a drum sander to take the boards to the final thickness would help. 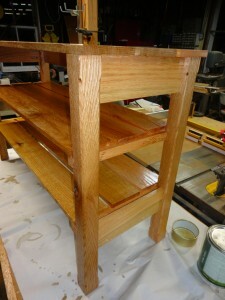 I did a single coat of shellac followed by two coats of wiping varnish. Maybe I should add a third coat tomorrow night, at least to the visible parts. What is the next project? I think a quick set of outside benches out of 2x4s for next to the fire pit. Another nice project I can cheat with pocket hole screws. I still think I need to make a storage shelf for the study/guest room. And bunk beds for the boys. On top of that lots of house projects to finish. I had another good weekend…. I got lots done. It is Mother’s Day weekend, so the boys went to their mom’s house on Saturday morning. But she let them stay until 11 instead of the usual 9AM. But of course the boys were up at 6AM on Saturday. And Will got upset because I had asked him to stay in bed until 7 (really wanting them to let me sleep in), but I forgot to tell Ben, so Ben got me up early. And I thought Will was still sleeping, so I didn’t go bother him. He came downstairs upset that he had to stay in his room until 7. Friday after school I took the boys to Fleming’s Feed store so they could get flowers for the garden. Will had decided he wanted to take one of the raised beds for his garden. Will and Ben picked flowers out and we headed home. Ben decided to take part of one of the other raised beds for his flowers. I helped both boys weed and then plant their flowers. Saturday morning we went to Holdridge’s nursery and got more flowers for their beds. And we planted the rest of the flowers. 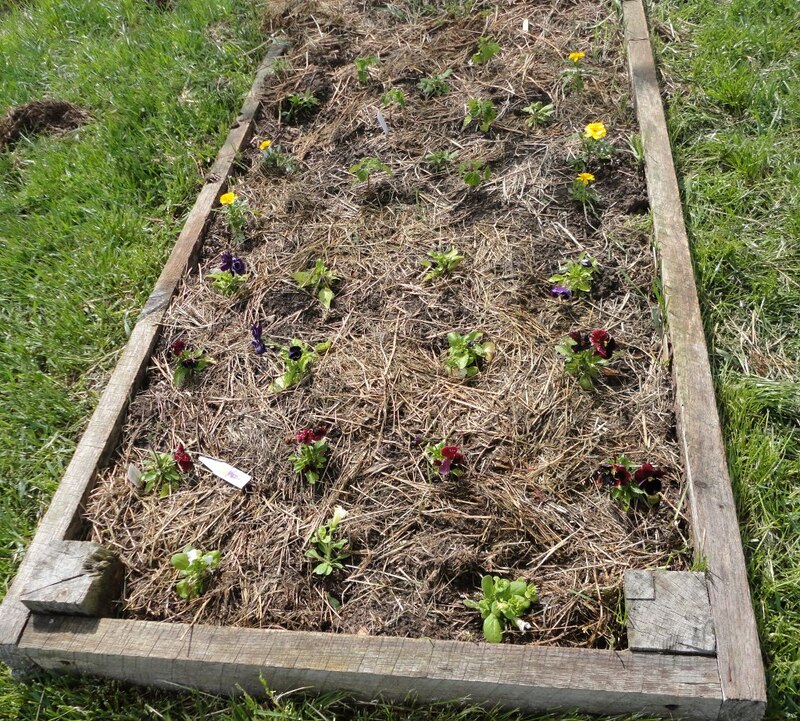 So, out of the three raised beds, the first on is cleared, and I planted seeds for a mixed flower bed. 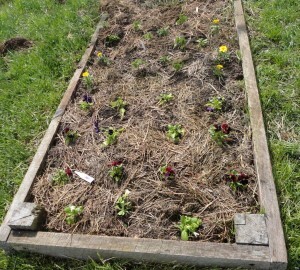 The second one is 1/2 Ben’s flowers, and I planted onions, broccoli and strawberries on the other half. Ok, strange mix. The third one (the smallest) is Will’s. We cleared half of it and planted his flowers. When he gets back this week we will have to clear the other half of it so he can plant the seeds (flowers and melons). I am also getting the daylillies in the front flower bed. It looks pretty bare this early in the year. I’m thinking I’ll plant some early bulbs in the fall and get flowers earlier in the spring. Maybe daffodils . I’ll have all summer to think about it. I was able to get a little bit of work done on Ben’s room – I painted the sashes for the last window (painted the inside). Now I have to get glass for them this week and set the glass and paint the exterior. 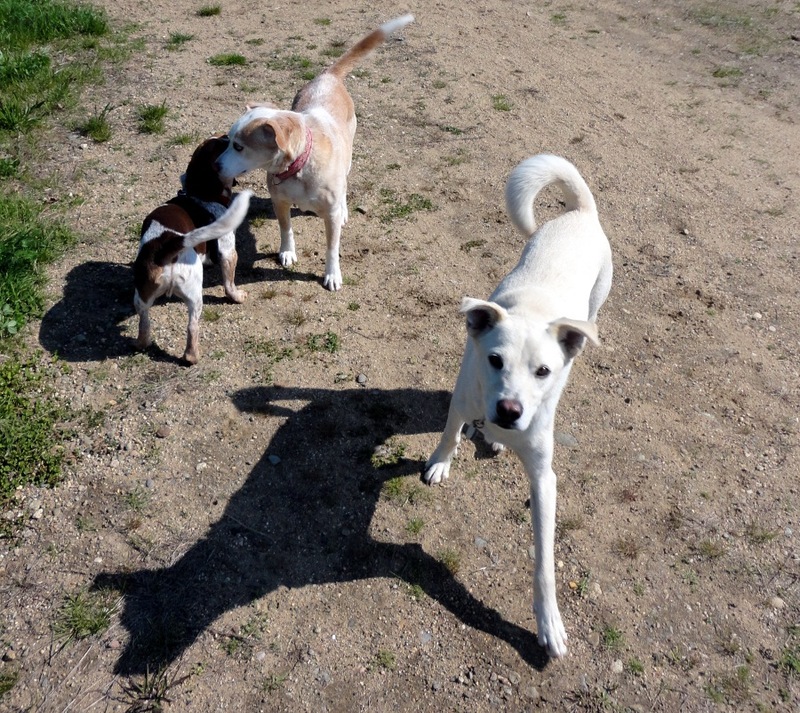 Of course, the highlight of the weekend for the dogs is the Sunday, hikes with dogs. It was a 2 hour hike at one of my favorite locations (Machimoodus State Park). I actually let Tucker off the leash for a bit. Until he picked up a scent and tried to follow it off. Luckily it was up a very steep hill and he couldn’t make it up. He came tumbling back down and I was able to grab him and put him on a leash. And to top it off, I was able to clean my workshop out a bit… it is almost usable. Next weekend is camping on the Connecticut River with my dad and the boys – if it doesn’t rain. I didn’t get everything completed I had hoped for the weekend. But it was a good weekend nonetheless. I didn’t get to Ben’s room (yes, I need to get some work done on the room – it’s been uncompleted for a very long time, and is almost finished) or to the camping gear (which I need to do soon because I’m going camping with the boys on the 13th if the weather supports). I did get Will a new bicycle and Ben a new bicycle helmet. Ben got Will’s old bike. 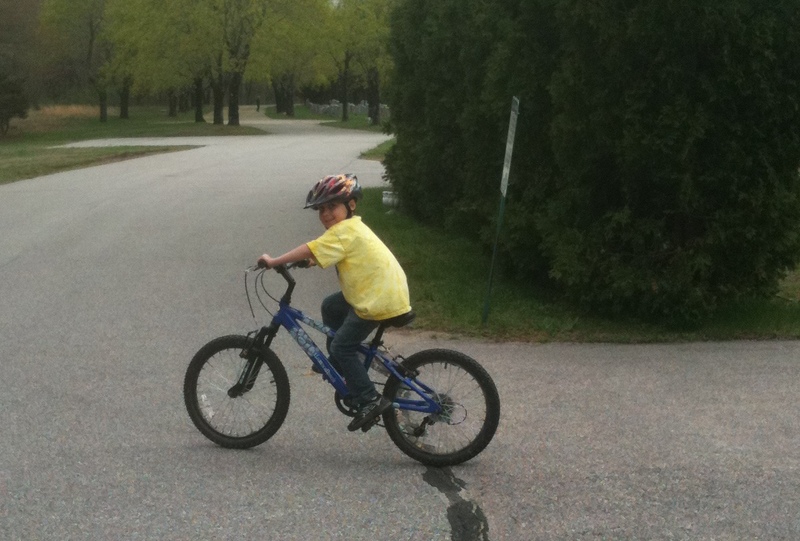 Both boys were very excited to go for a bike ride, and the weather on Saturday was perfect for biking. I rode with them down to the cemetery around the corner, and we rode there for a while. Now to find some easy bike trails around the state this summer. All three of us got hair cuts. Will complained the most, and of course he got the least cut off. I did clean the house. A little bit. One of these days I’ll invite guests over and have to really clean it. I also mowed part of the yard – at least the part that I had planned for the weekend. I installed the new stereo in the Jeep. I had expected it to be more difficult than it was. It is nice to actually have a project that goes as planned once in a while. I also found time to start a bonfire (ok, more of a camping fire this time). Will and Ben begged for one. As soon as I lit the fire, the neighbor drove down with his backhoe and started moving dirt around in the field next door. So the boys ignored the fire and went over there to watch. Go figure. And then we finished Saturday with homemade pizza. And to be crazy, I used actual pizza sauce instead of the normal (being lazy) pasta sauce. Today – transition morning. A nice homemade breakfast with the boys (with eggs thanks to Mark and Rob – the boys prefer the local eggs). Then after the boys left, I went to Nayantaquit Trail and met the Hiking with Dogs meetup.com group. We hiked for two hours (with breaks). Targa and Tucker couldn’t be happier. They get so excited about the hikes, that as soon as we pull into the parking lot and they see the dogs running around, they go crazy. I actually let Tucker off the leash a bit today (but only a little bit). 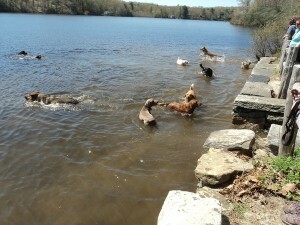 And Targa finally made a friend on the hike (a German Shepard named Zeus).